Posted March 25, 2019 by argus & filed under News. Phoenix, AZ –Jeff Gorden of Eagle Commercial Realty Services has arranged the sale of PremieRVehicle Storage in Marana, Arizona. 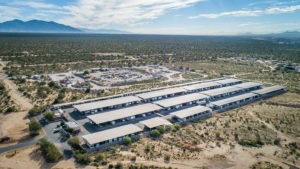 The 100% RV-storage facility sold March 20, 2019 for $6,050,000. The property spans over eight and a half acres and provides 462 spaces of RV and Boat storage. Eagle Commercial represented the Seller. A California based buyer won the deal.